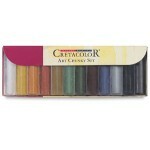 Art Chunky Charcoal - 12pc Used for sketching and shading when teaching tones to students. Good alternate to using willow charcoal - keeps fingers clean. 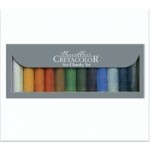 ..
Art Chunky Chalk - 12pc ..
Extra-large, round sticks of coloured charcoal create broad, sweeping strokes of brilliant colour. Oil-free and water-soluble — Art Chunky revolutionises charcoal drawing. . Available in White, Sepia, Grey, Dark Orange, Sanguine, Ochre, Green . Please select the colours you require from the Av..